Honestly, I do not wake up thinking about how much money this guy is going to cost the world, but it does seem that way. And most of you would say that to vote for a particular candidate because of his skin color would be a bad thing, but I completely disagree. Barry's skin color is the ONLY reason that you could have to vote for him that is legitimate. Lemme 'splain. These facts are only proven to be true 100% of the time. Is the jury still out on the question? Yes, if they are morons. Point. Every single one of Barry's ideas for "change" in government has been tried numerous times and have been proven to be monumental failures, think 1930's and 40's Germany or Italy. As a quick aside, you can try the same things for different reasons, but does that make the basic idea any different? No, the situation is this, YOUR INTENTIONS FOR THE THINGS YOU DO ARE IRRELEVANT. You must observe the truth of the situation and pay close attention to the past performance of certain things. Remember, road to Hell and all. Now, let's talk about skin color. Something that Barry has tried to completely disregard (while continually pointing it out) as a reason to vote for him when it is the ONLY sane reason that you could possibly have. Even though Barry is half-white, his appearance lends one to see him as a black man. That is just a simple fact there. Do most of us think that Blacks are inferior to Whites? Of course not. So, when Barry's Presidency returns us to the economic catastrophe that was Jimmy Carter's administration will we blame Blacks? No. Well, maybe Robert Byrd (Dumbass-WV) will, but he has always been a racist, just like most Democrats. The end result is this. Maybe electing a Black Democrat President will be the best thing that this country has ever seen. It will allow the Black voting bloc to see exactly how badly they, as a race, fare under the rule of Democrats and they will be shown that Democrats hate, hate, hate happiness. Of course, the fact remains that we might all starve to death while we are waiting for the revelation to occur that Democrats are bad for everyone's pursuit of happiness, but isn't "tough love" what parenting is all about anyway? Yeah, I am racist, I don't like people that are not 100% of any certain race. Whaddaya mean, no one is a purebred anymore? 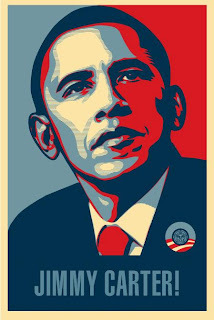 Make your very own "Hopey-Change" poster HERE.